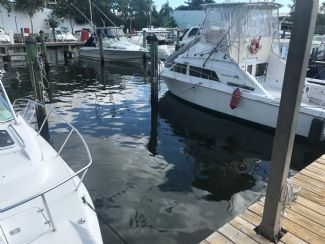 LOCATED AT MIAMI RIVER RUN YACHT CLUB BOAT DOCK ACCOMMODATES A 33' BY 13 WIDE BOAT, WITH TIDE SLIDE MOORING, EXCELLENT MARINA LOCATION WITH A TOTAL OF 71 PRIVATE SLIPS, 24 HOUR INTERNET SECURITY CAMERAS, ELECTRICAL SERVICE, FREE FRESH WATER FOR DETAILING. HURRICANE SAFE MARINA, OCEAN ACCESS WITH NO FIXED HEIGHT RESTRICTIONS, PRIVATE PARKING AND ELECTRIC GATE ACCESS. Sale Price: $79,000 Mostly listings charge by "Flat Rate" per month.